Migrants are seen before being rescued by "Save the Children" NGO crew from the ship Vos Hestia in the Mediterranean sea off Libya coast, June 15, 2017. Picture by STEFANO RELLANDINI/Reuters/PA Images. All rights reserved.The debate around migration in the Mediterranean suffers from a puzzling amnesia, particularly from critics of Europe’s dealings in Libya. For example, recently Refugees Deeply published a piece stating the EU “must not fuel” the hellish situation there. While moral outrage about outsourcing human rights abuses is justified and indeed crucial, critics would do well to understand its historical and political context if they are to offer alternatives. Cutting deals with transit states to stop migrants has always been central to EU policy. Irregular migration was a top concern as Europe developed its open border regime and foreign policy in the late 1990s and early 2000s. Foreign policy was driven by domestic political distaste for asylum and uncontrolled migration given new South-North migration dynamics, wars in the former Yugoslavia, and EU enlargement to Central and Eastern Europe. Italian advocacy opened the door for broader European cooperation. A 2003 Commission exploratory mission found Libya “ready and willing” to cooperate on irregular migration, and Libya announced an end to its WMD program.3 In 2004 the Council announced a “policy of engagement” and sent its first technical mission for the expressed purpose of stemming irregular migration. In 2005 it launched an “ad-hoc dialogue” on irregular migration.4 The EU lifted sanctions in mid October, and immediately allocated €2 million for securing Libya’s southern borders and €3.2 million for the coastguard. The Commission, Italian Interior Ministry, and UK Border Agency funded deterrence campaigns and “Assisted Voluntary Return” operations in Libya through the International Organization for Migration. The Commission channeled €4.5 million for southern border surveillance from 2008-2009. The UK first floated plans for “Regional Protection Zones” and “Transit Processing Centres” in 2003, borrowing directly from Australia’s “Pacific Solution” of warehousing asylum seekers on offshore islands.6 In 2004 and 2005 Germany and Italy jointly advocated for establishing asylum processing camps in Libya, which they repeated again through 2016 and 2017. The hard fact is that the “Friendship Pact” and EU funding worked. In 2008 almost 40,000 migrants crossed the Central Mediterranean from Libya to Italy and Malta. From 2008 onward Italy returned asylum seekers, and cooperated to push back migrants at sea. Migrants were trapped in Libya or pushed to the emerging route in the Sinai, the site of its own heinous abuses. Central Mediterranean crossings dropped to 11,000 in 2009, and then to a low of 4,500 in 2010. But the main reason the deal worked is because direct payments and opportunities for trade were sufficient to offset lost smuggling revenues for the regime and its patronage networks. My research has involved a series of visits to Brussels to discuss fieldwork findings. EU Parliamentarians, members of the Council of Europe, and rights groups consistently stress that they’ve brought the situation to the Commission and Member States’ attention. Human Rights Watch offered a detailed account of the impacts of the deal in 2009. The scale of journalistic attention now makes any claims to ignorance absurd. Of course the Commission and Council knew what Italy was up to with Libya. […] Every Member State has the right to enter into bilateral relationships and to control their borders and no state would dare to transgress this right. The difference in the EU is we have a common interest in controlling external borders. Do academics believe that they don’t discuss these plans in the Council? Who would say no? France, the UK, Germany? Better the migration is managed in North Africa than in Calais. Can you imagine? Calais is an unregulated refugee camp in France, right out in the open, with NGOs offering humanitarian aid. Its two hours from [Brussels]. It’s a total embarrassment. Tomorrow Europe might no longer be European, and even black, as there are millions who want to come in […] What will be the reaction of the white and Christian Europeans faced with this influx of starving and ignorant Africans […] We don't know if Europe will remain an advanced and united continent or if it will be destroyed, as happened with the barbarian invasions. Everyone knows we have to do something. It’s a crisis and we’re making decisions like it’s a crisis. Libya is anarchy. ISIS is there, and Italy is still trying to make deals. [EU foreign policy chief] Mogherini wants to pick a group and make concessions. Think of it: pick some Islamist rebels, probably full of people from the Qaddafi regime, who we just killed, recognize them, and pay them to stop the boats. That is the plan! Now it seems like a dream to have a strong dictator you could make a deal with. Indeed, the EU seems to be grasping at straws and paying off smugglers who continue to operate. In 2014 Libyan Army brigades “diverted” materiel and weapons from the Tripoli International Airport destined for the EU Border Assistance Mission. A 2015 report from the UN Security Council Panel of Experts on Libya noted that trafficking networks are “embedded within Libyan armed groups controlling territory along the smuggling routes.” Controls on Libya’s southern borders rely on cooperation with militias who run the smuggling rings. In March 2017 the Commission, EEAS, and representatives of eight Member States met with the internationally recognized Government of National Accord (based in Tripoli) in Rome to sign a commitment for sending €90 million in support to the Interior Ministry and Coast Guard. The deal included yet another plan to set up camps for asylum processing “in full respect of peoples’ rights.” The EU directly funds the Directorate for the Combat of Illegal Immigration (DCIM), which runs 29 detention facilities associated with human rights abuses. The UN Support Mission for Libya detailed extensive cases where the DCIM and Coast Guard collaborated with and were indistinguishable from militias, and profited from forced labour and trade in migrants. In 2017 the NGO Sea-Watch reported coastguard boats firing on rescue ships and migrants at sea. Video footage shows coastguards whipping and flogging migrants. 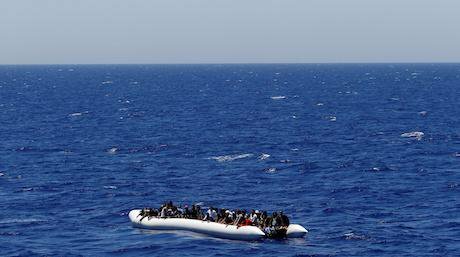 MSF reported uniformed Coast Guards on Italian-supplied ships looting cash and phones. The UN has reported migrants being sold at slave auctions. These dynamics represent continuity from the Qaddafi years. What has changed is the fact that Europe no longer has a strong and (somewhat) credible partner in Libya. Different militias vie for control of lucrative smuggling hubs on the coast and at southern borders. In a bizarre twist, the Italian government embarked on a smear campaign on NGOs conducting Search and Rescue (SAR) operations in the Mediterranean. They moved from the claim that SAR acts as a pull factor for migrants, to the claim that NGOs actively collude with smugglers and traffickers. Not only are the claims unfounded, but if the EU and Member States are concerned with collusion they need look no further than their own bilateral relations with regimes and militias across Africa and the Middle East. Driven by domestic politics and the need to be seen to be doing something, Europe has locked itself in a cycle of dodgy deals. Driven by domestic politics and the need to be seen to be doing something, Europe has locked itself in a cycle of dodgy deals. The much-maligned EU / Turkey deal is misconstrued as an emergency measure to stop the 2015 migration crisis and close the Western Balkan route. In light of the lessons from Libya (and indeed from the Western Mediterranean), it should instead be understood as an instance of EU policy learning. While normatively troubling, strong and stable authoritarian regimes can stop irregular migration flows. The EU understands this quite well. Transit states also learn from history. Regimes across Africa, the Middle East, and indeed Central and Eastern Europe have learned to speak the language of securitized migration controls in order to leverage EU funding. Europe is truly stuck between a rock and hard place, partly of their own making. In the absence of stability and opportunity in sending states, the remaining policy options are limited. In the meantime, smugglers and militias get richer and migrants suffer terrible fates. 2 Paoletti, Emanuela. 2011. “Power Relations and International Migration: The Case of Italy and Libya.” Political Studies 59 (2): 269–89. 3 Bosse, Giselle. 2013. “European Union Policy towards Belarus and Libya: Old and New Double Standards?” In The European Union Neighbourhood: Challenges and Opportunities, edited by Teresa Cierco. The International Political Economy of New Regionalisms Series. Farnham, Surrey ; Burlington, VT: CEPESE/Ashgate. 4 Hamood, Sara. 2011. “EU-Libya Cooperation on Migration: A Raw Deal for Refugees and Migrants?” Journal of Refugee Studies. 21 (1): 19–42. 5 Paoletti 2011: 274 (quoting Il Manifesto). 6 Schuster, Liza. 2005. “The Realities of a New Asylum Paradigm.” Working Paper. Oxford, United Kingdom: COMPAS. 7 Coluccello, Salvatore, and Simon Massey. 2007. “Out of Africa: The Human Trade between Libya and Lampedusa.” Trends in Organized Crime 10 (4): 77–90. 8 Greenhill, Kelly M. 2010. Weapons of Mass Migration: Forced Displacement, Coercion, and Foreign Policy. Cornell Studies in Security Affairs. Ithaca, N.Y: Cornell University Press.